Manchester United boss Louis van Gaal is concerned after his side's third consecutive goalless draw, the first time it has happened since 2005. Saturday's stalemate at Crystal Palace came after 0-0 draws against Manchester City last Sunday and Middlesbrough in the Capital One Cup in midweek. United are fourth in the Premier League but have not scored in over five hours. 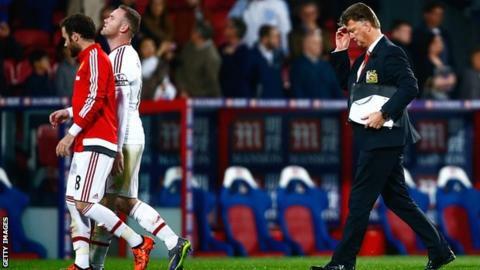 "There's a big concern but I already said that after the match against Middlesbrough," said Van Gaal. "[In that match] we created many chances but did not finish. "[Today] we didn't create so many chances so it's more difficult. When you don't keep the ball you can't create chances." Despite his team failing to score for the third successive game, Van Gaal rejected suggestions that his players are lacking in confidence. "I cannot see that," he said. "When I see the characters I don't think they doubt about that quality. It can change in one match and let it be against CSKA Moscow [in the Champions League at Old Trafford on Tuesday], because we need a victory." Van Gaal's side have the meanest defence in the league, having conceded only eight goals in 11 games, but have drawn criticism from former United and England midfielder Paul Scholes for lacking creativity, and they had only one shot on target at Selhurst Park - a Wayne Rooney free-kick. After weathering early pressure from Palace in a period Van Gaal called "disastrous", and watching Palace waste several second-half chances, United held on to earn a seventh clean sheet of the season. During the game, United fans sang "we're Man United, we want to attack", but Van Gaal seemed unfazed by this. "I think the right to defend is always there, and this was one of the first times - at Arsenal of course, also - when we were not the better team away," he said. "So they have seen it very good I think. They can sing that, but the next game they shall sing maybe in another way." Rooney, who had another good chance to score in the first half, played as the lead striker, with Anthony Martial again deployed on the left wing. "As a manager I have to see what is the best balance in the team," added Van Gaal of the way he set up his attack. "So I have to decide also every week depending on the game plan and qualities of the opponent. "We have played with [Martial] in the striker's position, but that was not the first time for him on the left. In Monaco he played more or less always on the left wing. "You can never tell as a coach that it was the right balance when you are not having the control of the game and I want to always control the game."